Hadyn Green tries out the Beats Studio headphones. “I’ve gone deaf!” That was my first thought when I put on the Beats Studio headphones and turned on their noise-cancelling function. It was that good. I’d read a number of reports about how the previous versions of Beats had heaps of style but far from the best sound. So I wasn’t expecting to be blown away. To my surprise the sound quality of the new Beats Studio headphones was very good, and sometimes even better than that. I listened to spoken word recordings, movies and various kinds of music. Even at loud volumes there was no distortion or lack of sound clarity. The bass tones were nice and deep and high notes were clear without being shrill. The voice clarity was also excellent. But noise cancelling is where the Beats Studio really shines. Everyone at Consumer NZ who put on the headphones was amazed at how they removed all ambient noise. One evening I handed the Beats around my friends in a noisy bar. The results were amazing … nearly all the noise died away. However, the noise cancelling is a double-edged sword. The Beats system has active noise-cancelling and so needs battery power. As well – annoyingly – you can’t listen to anything through the Beats unless the battery is on. So either way they chew up power. But they do have a rechargeable 20-hour battery that charges via micro USB. They also come with a wall plug so you can charge them virtually anywhere. The cord going into the headphones can be removed. However, plugging in the cord automatically turns on the noise cancelling and starts using the battery – so if you forget to unplug it overnight, like I did, your headphones probably won’t be working the next morning. There’s a button on the right headphone for turning them on and off. Remember to use it (or keep them unplugged when not in use). Be aware that plugging and unplugging the cord overrides the power button. While they’re a little heavier than other headphones I’ve used and I wore them for long periods, they sat comfortably on my head. They also fold up to fit inside the supplied hard-cover pouch. It’s not that small, but it’s still handy. The Beats Studios are active noise-cancelling headphones. The noise cancelling works very well (even loud bars were no problem) and the sound quality is very good. 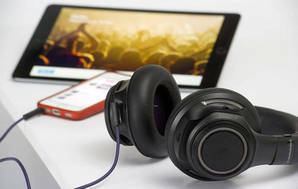 But the headphones have to be turned on before you can listen to music – so you need to be careful about battery life. Compare test results for noise-cancelling and standard headphones and find out about the features to consider when you're choosing new headphones.